At that time, Eliminate-Obstructions(Sarva-nivaraNaviskambhin) Bodhisattva said to the Buddha: "Bhagavan(World Honored One), now how can I get this Six-Words-Great-Enlightening-Dharani? Anyone who has it will be accordant with innumerable Dhyanas and Samadhis. Having this Dharani is the same as attaining Anuttara-Samyak-Sambodhi. It leads us to the door of liberation and reveals the state of Nirvana. It eliminates greed, angers and ignorance forever and perfects the Dharma-Stores. It breaks transmigrations in the five destinies and purifies all hells. It eliminates all afflictions and saves all animals. Its perfect Dharma-Flavor cannot be fully proclaimed even by Universal-Wisdom(sarva-jnana). Bhagavan, I need this Six-Words-Great-Enlightening-Dharani. For this Dharani, I can fill the four great continents with treasures and donate all of them in order to write it down. Bhagavan, if there is not enough ink, paper or pen, I can prick my body to take out my blood and use it as the ink, I can peel off my skin and use it as the paper, and I can crack my bone and use it as the pen. Bhagavan, I am not miserly and will never regret for doing so, I respect this Dharani as if it is my parent." 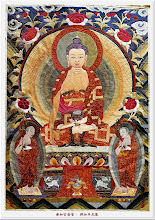 Then the Buddha told Eliminate-Obstructions Bodhisattva: "Virtuous man, I remember that in the past, for this Six-Words-Great-Enlightening-Dharani, I had been to as many worlds as there are atoms in the universe, and had offered and sustained countless hundreds of thousands of millions of kotis of nayutas of Tathagatas. But I had never gained or heard this Dharani in any of the worlds of those Tathagatas. 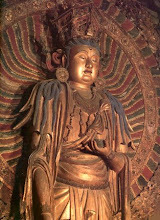 Afterward, there was a Buddha named Treasure-Supremacy (Ratnottama), Thus-Come One, worthy of offerings, of right and universal knowledge, perfect clarity and conduct, well gone, understanding the world, unexcelled worthy, taming and subduing hero, teacher of heavenly and human beings, Buddha, World-Honored One." "At that time, I wept sorrowfully in front of that Buddha, and then that Tathagata, Arhat, Samyak-sambuddha told me: 'Virtuous man, do not weep so sorrowfully. Virtuous man, you should go there, go to the world of Lotus-Supremacy Tathagata, Arhat, Samyak-sambuddha. That Buddha knows this Six-Words-Great-Enlightening-Dharani.'" "Virtuous man, I then said farewell to Treasure-Supremacy Tathagata, left his world, and went to the Buddha-World of Lotus-Supremacy (Padmottama) Tathagata. 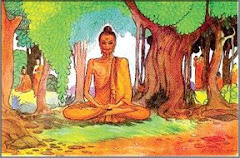 Having arrived there, I bowed to the feet of the Buddha, with my joining palms ahead, I said: 'Bhagavan, please give me the Six-Words-Great-Enlightening-Dharani, which is the king of True-Words(mantra), being mindful of even its name can eliminate sins and filth and make us attain Bodhi quickly. I am tired, because I had been to innumerable worlds but could not get it, and I am finally here now.'" "Lotus-Supremacy Tathagata then told me the merits and virtues of this Six-Words-Great-Enlightening-Dharani: 'Virtuous man, I can count the number of all atoms of the universe, but virtuous man, if anyone chants this Six-Words-Great-Enlightening-Dharani just once, I cannot count the number of the merits and virtues that he gains.'" "'Virtuous man, for another example, I can count all the sands in the great oceans one by one, but virtuous man, if anyone chants this Six-Words-Great-Enlightening-Dharani once, I cannot count the number of the merits and virtues that he gains.'" "'Virtuous man, for another example, suppose there is a storehouse made by heavenly beings, it is 1000 yojana in length, 1000 yojana in width and 100 yojana in height, it is filled with sesame seeds and has no extra space for even one needle. The guardian of this storehouse will not become old and will not die; he throws one sesame seed out every 100 kalpas, in such a manner, he throws out all the sesame seeds in the storehouse, I can count that number, but virtuous man, if anyone chants this Six-Words-Great-Enlightening-Dharani once, I cannot count the number of the merits and virtues that he gains.'" "'Virtuous man, for another example, there are various paddies, wheat, etc. planted all over the four great continents, dragon kings make the rain fall down and then all plants are matured. People harvest all the crops and get all grains, and spread them all over the southern continent (Jambudvipa). Virtuous man, I can count all those grains one by one, but virtuous man, if anyone chants this Six-Words-Great-Enlightening-Dharani once, I cannot count the number of the merits and virtues that he gains.'" "'Virtuous man, in the southern continent (Jambudvipa), all the great rivers that are flowing day and night are: Sido river, Kiga river, Yamuna river, Vachu river, Siadarunra river, Candana-bhaga river, Ahravadi river, Sumagata river, Simahagarasunali river, etc. Those rivers, each along with their 5000 branch rivers, are flowing into oceans day and night. Virtuous man, I can count the drops of water of all those great rivers one by one, but virtuous man, if anyone chants this Six-Words-Great-Enlightening-Dharani once, I cannot count the number of the merits and virtues that he gains.'" "'Virtuous man, for another example, for all four-feet sentient beings in the four great continents, such as lions, elephants, horses, yaks, buffalos, tigers, wolves, monkeys, deer, goats, sheep, jackals, rabbits, and so on. I can count all the hair of them one by one, but virtuous man, if anyone chants this Six-Words-Great-Enlightening-Dharani once, I cannot count the number of the merits and virtues that he gains.'" "'Virtuous man, for another example, suppose there is a Diamond-hook (Vajrankusa) mountain king, which is 99 thousand yojana in height, 84 thousand yojana in depth, 84 thousand yojana in length and 84 thousand yojana in width. And a person who will never become old and will never die has to spend one kalpa to circumambulate that mountain once. For such a mountain king, I can use a Kausika-cloth(a heavenly extremely thin cloth) to wipe it off, but if anyone chants this Six-Words-Great-Enlightening-Dharani one time, I cannot fully tell how many merits and virtues he gains.'" "'Virtuous man, for another example, suppose there is a huge ocean which is 84 thousand yojana in depth, and its surface area is immeasurable. I can dip a single tip of hair in that ocean repeatedly to use up all the water, but virtuous man, if anyone chants this Six-Words-Great-Enlightening-Dharani once, I cannot fully tell how many merits and virtues he gains.'" "'Virtuous man, for another example, I can count up all leaves of the great Srisa forest one by one, but virtuous man, if anyone chants this Six-Words-Great-Enlightening-Dharani once, I cannot fully tell how many merits and virtues he gains.'" "'Virtuous man, for another example, if all men, women and children in the four great continents become Bodhisattvas of the seven Bhumi(stage), then the sum of their merits and virtues is equal to the merits and virtues gained by chanting Six-Words-Great-Enlightening-Dharani once.'" "'Virtuous man, for another example, if it rains days and nights for fully one kalpa, I can count the drops of those rainwater one by one; but if anyone chants this Six-Words-Great-Enlightening-Dharani once, the number of the merits and virtues that he gains are much more than the number of those drops.'" "'Virtuous man, for another example, if one billion Tathagatas stay together in one place, any some person offers and sustains them with various clothes, drinks, foods, seats, beds, soup, medicine, and many other goods, in such a way those Tathagatas count the merits and virtues of this Six-Words-Great-Enlightening-Dharani together for one heavenly kalpa, but they cannot figure out the sum.'" "'I also cannot figure out that not only when I am now in this world, but also when I am in Samadhi.'" "'Virtuous man, this Dharma is delicate and wonderful, it corresponds to all preparative practices, analytical meditations and wisdom. You will gain this delicate and wonderful Heart-Dharma in the future. That Avalokitesvara Bodhisattva is expert at this Six-Words-Great-Enlightening-Dharani. Virtuous man, in the past, after the preparative practices, I had been to countless hundreds of thousands of millions of kotis of nayutas of worlds, and finally I arrived the world of Infinite-Life(Amitayus) Tathagata. For this Dharma, I joined my palms together, wept and cried in front of him.'" "'At that time, because Infinite-Life Tathagata knows my present and future, he said to me: 'Virtuous man, do you need this Six-Words-Great-Enlightening-King-Meditation-and-Practice-Yoga?' I then replied: 'Yes I need this Dharma, Bhagavan, I need this Dharma, Sugata(well gone). I need it like a thirsty person needs water. Bhagavan, in order to learn this Six-Words-Great-Enlightening-Dharani, I had been to innumerable worlds, had offered and sustained innumerable hundreds of thousands of millions of kotis of nayutas of Tathagatas, but I have not gained this Six-Words-Great-Enlightening-King-Dharani. Bhagavan, please heal my foolishness, just like making a poor person rich, like telling the correct way for a person who lost his way, like planting Sala-trees beside the thoroughfare to make shelters under the flaming sun. Bhagavan, I am thirsty for this Dharma, please teach me, to make me stay in the ultimate enlightenment and wear the Vajra-Armor.''" "'At that time, Infinite-Life Tathagata, Arhat, Samyak-sambuddha said to Avalokitesvara Bodhisattva with the Kalavinka (*) sound: 'Virtuous man, do you see that, for this Six-Words-Great-Enlightening-Dharani, this Lotus-Supremacy Tathagata, Arhat, Samyak-sambuddha have traveled throughout innumerable hundreds of thousands of millions of kotis of nayutas of worlds. Virtuous man, you should tell him this Six-Words-Great-Enlightening-Dharani, because this Tathagata comes for it.'" "'Avalokitesvara Bodhisattva said to the Bhagavan: 'Anyone who did not see the Mandala(altar) cannot gain this Dharma, much less to know the Lotus Mudra(gesture), Mani-Holding Mudra, Universal-King Mudra, and the pure nature of the Mandala. 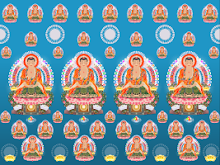 The appearance of the Mandala is: The Mandala is five-elbows in length and five-elbows in width, there is an image of Amitabha(Infinite-Life) Buddha at the center of the Mandala; Indranila Curna(aromatic powder), Padmaraga Curna, Marakata Curna, Sphatika Curna, and Suvarnarupya Curna are scattered. 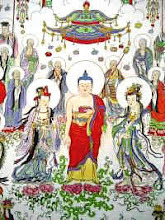 On the right side of Amitabha Tathagata, there is an image of Maha-Mani-Dhara (Great-Mani-Holding) Bodhisattva, On the left side of the Buddha, there is an image of Six-Words-Great-Enlightenment(Four arms Avalokitesvara Bodhisattva). For the four arms image, the skin color is as white as the moon, and the body is decorated with various jewels; His left hand is holding a lotus, on the lotus there is a Mani pearl; His right hand is holding a rosary(prayer beads); His lower two hands are making a Universal-King Mudra. Under the feet of Six-Words-Great-Enlightenment, there are some heavenly beings decorated with various jewels. Each of those heavenly being is holding an incense burner in his right hand, and holding a bowl filled with treasures in his left hand. At the four corners of the Mandala, there are the four guardian gods who are holding various weapons and staffs. At the four outer corner of the Mandala, there are four merit-bottles(purna-ghata/kalasa) filled with various Mani jewels. 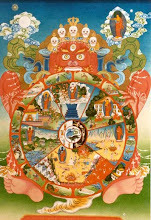 If any virtuous man or woman is ready to enter this Mandala, he can write down the names of all his relatives onto a paper, and throw the paper into the Mandala, then all those relatives will attain the Bodhisattva position, will get away from sufferings and attain Anuttara-Samyak-Sambodhi quickly. Acarya(teacher)s should not teach this method indiscreetly. If there are some persons who are good at teaching others with expedient and skillful means, trustfully believe in Mahayana, diligent in preparative practices, and willing to seek for liberation, for such persons, Acarya(teacher)s should teach them this Dharma and should not teach them any Exterior-Paths theories.''" "'At that time, Amitabha Tathagata, Arhat, Samyak-sambuddha said to Avalokitesvara Bodhisattva: "Virtuous man, if the virtuous men or women have those five kinds of Curnas, then they can set up this Mandala; but if they are poor or unable to get those Curnas, what should they do?' 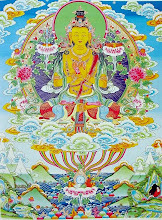 Avalokitesvara Bodhisattva replied: 'Bhagavan, as an expedient means, they can use various colored materials, and make offerings with various fragrant flowers. If they can not even do that, or when they are in lodgings, journeys, or when they are walking, the Acarya(teacher)s can create the Mandala with their mental power and make the Acarya Mudra.''" During the speech of this Six-Words-Great-Enlightening-Dharani, the four great continents and all heavenly palaces were shaking like banana leaves, the four great oceans were chopping and surging, all the obstruction-making beings, including Vinayaka(Pig-head god and Elephant-nose god)s, Yaksas, Raksas, Kumbhanda(energy-eating ghost)s, Maha-kalas, and so on, with their relatives and other demons, were all frightened, they dispersed and escaped hastily." "At that time, Lotus-Supremacy Tathagata, Arhat, Samyak-sambuddha spread his elephant-king-trunk like arm, and gave Avalokitesvara Bodhisattva a jewel-necklace which is worth millions of pearls, as an offering. Avalokitesvara Bodhisattva accepted that necklace and presented it to Infinite-Life(Amitayus) Tathagata, Arhat, Samyak-sambuddha. 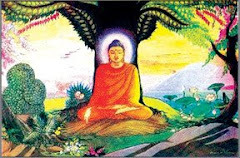 Infinite-Life Buddha accepted, and then presented it back to Lotus-Supremacy Tathagata. Having gained this Six-Words-Great-Enlightening-Dharani, Lotus-Supremacy Buddha then returned to his Buddha-world." "For this reason, virtuous man, I had heard this Dharani in the world of that Lotus-Supremacy Tathagata, Arhat, Samyak-sambuddha in the past." Eliminate-Obstructions Bodhisattva then said to the Buddha: "Bhagavan, now how can I gain this Six-Words-Great-Enlightening-Dharani? Bhagavan, this accordant Dharani is an Amrita(holy refreshing cool drink) full of virtuous flavors. Bhagavan, if I get to hear this Dharani, I will keep reciting it in my mind, accept and uphold it without laziness, to make all sentient beings hear this Dharani and gain great merits and virtues. So Bhagavan, please tell me." The Buddha said: "Virtuous man, if anyone writes this Six-Words-Great-Enlightening-Dharani, that is equal to writing 84 thousand Dharma-Stores. If anyone uses heavenly gold and jewels to make as many Buddha-statues as there are fine dust in the world and then praises, offers and sustains them for one day, the good results that he will gain are less than the good results gained by writing one of the words of this Six-Words-Great-Enlightening-Dharani. The merits and virtues of this Dharani is unimaginable, it can lead us to the ultimate liberation. If any virtuous man or virtuous woman read this Six-Words-Great-Enlightening-Dharani one time in the correct manner, he will achieve these 108 Samadhis including Holding-Mani-Jewels Samadhi, Vast Samadhi, Purify-hells-and-animal-realms Samadhi, Vajra-Armor Samadhi, Wonder-flat-feet Samadhi. Enter-all-expedient-means Samadhi, Enter-all-Dharmas Samadhi, Contemplate-Sublime Samadhi, Dharma-Vehicle-Sound Samadhi, Get-away-from-Greed-Anger-and-Ignorance Samadhi, No-limitation Samadhi, Six-Paramita-Gate Samadhi, Earth-Hold-Great-Wonderful-High Samadhi, Save-all-frightened-beings Samadhi, Reveal-all-Buddha-Worlds Samadhi, Observe-all-Buddhas Samadhi, etc." Eliminate-Obstructions Bodhisattva then asked the Buddha: "Bhagavan, now where can I get this Six-Words-Great-Enlightening-Dharani? Please tell me." The Buddha said: "Virtuous man, in Varanasi city there is a Dharma-master who constantly keep meditating, upholding, reciting and chanting this Six-Words-Great-Enlightening-Dharani." Eliminate-Obstructions Bodhisattva said to the Bhagavan: "So now I wish to go to Varanasi city, to meet that Dharma-master, to worship, offer and sustain him." 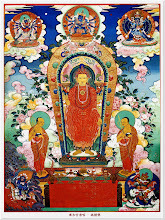 The Buddha said: "Good, good, virtuous man, that Dharma-master is uncommon and worshipful, because he can uphold this Six-Words-Great-Enlightening-Dharani, seeing him is the same as seeing the Tathagata, is the same as seeing a mass of blessings and virtues, is the same as seeing an accumulation of treasure, is the same as seeing the Wishes-fulfilling-Mani-pearl, is the same as seeing Dharma Store, and is the same as seeing the savior. Virtuous man, when you see that Dharma-master, you should not despise or doubt him, otherwise I am afraid that you would lose the position of Bodhisattva and fall into the sufferings. Virtuous man, that Dharma-master does not keep precepts perfectly and has a wife, his Kashaya(robe) is stained with feces and urine, and his demeanor is not majestic." Eliminate-Obstructions Bodhisattva then said to the Bhagavan: "It will be as the Buddha taught". Thereupon, Eliminate-Obstructions Bodhisattva, together with innumerable Bodhisattvas, monks, nuns, elders, boys, girls, corteges, started off to make offerings. 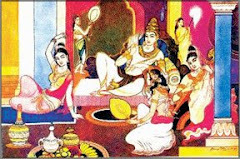 They were holding heavenly umbrellas, various offerings, precious crowns, jewelries, sublime necklaces, finger rings, precious bracelets, Kausika clothes, colorful silk fabrics, and beds. 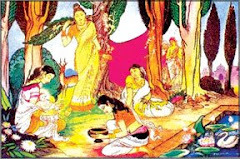 They were also holding various exquisite flowers, including utpala flowers, Wakumuna flowers, Wabunnalika flowers, Mandara flowers, Maha-Mandara flowers, Manjusaka flowers, Maha-Manjusaka flowers, Udumbara flowers, and many tree-flowers, including Campaka flowers, Kalavela flowers, Patala flowers, Ahdhimukdaka flowers, Variska-sawakunda flowers, Somana flowers, Malika flowers. Mandarin ducks, white cranes and saris were flying and following them. They were also holding hundreds kind of leaves of green, yellow, red, white, purple, Sphatika, and many other colors, and holding various rare fruits. With so many offerings, they went to Varanasi city to visit the abode of the Dharma-master. When they arrived, they bowed at the feet of the Dharma-master, although they saw that the Dharma-master does not keep precepts perfectly and does not behave majestically, they made offerings to him with umbrellas, materials, fragrant flowers, clothes, adornments, etc. Having made so many offerings, Eliminate-Obstructions Bodhisattva joined his palms in front of the Dharma-master and said: "The great Dharma store is the store of Amrita(nectar) flavor, it is an extremely deep Dharma-ocean, and is as vast as the universes. It makes all living beings listen to your preaching. When you are preaching Dharmas, Gods, dragons, Yaksas, Gandharvas, Asuras, Garudas, Mahoragas, human and nonhuman beings all come to listen to your preaching. Those audiences have gained so many blessings and merits, they are like great Vajras who can liberate the sentient beings from the tangles, shackles, and retributions of transmigrations(samsara). Because the people who live in this Varanasi city often see you, their various sins are all cleansed, just like forest being burnt by fire. The Tathagata, Arhat, Samyak-sambuddha completely understands you. Now, innumerable hundreds of thousands of millions of kotis of nayutas of Bodhisattvas have come and made offerings to you, Great-Brahma heaven gods, Narayana heaven gods, Mahesvara(The Greatest god of three-realms), Gods of suns, Gods of moons, Gods of wind, Gods of water, Gods of fire, Yama dharma king(Lord of hells), and the four great heavenly kings have all come to make offerings to you." At that time the Dharma-master said: "Virtuous man, are you joking or serious? Sage, is your goal to eliminate the sufferings of transmigrations for all worlds? Virtuous man, if anyone gets this Six-Words-Great-Enlightening-Dharani, then the three poisons: greed, anger, and ignorance cannot pollute him. He is like a treasure with pure-gold-violet-tinge color, which cannot to be stained by dust and dirt. Virtuous man, this Six-Words-Great-Enlightening-Dharani is so sacrosanct, if anyone wears it on his body, holds it or carries it with him, he also will not be polluted by greed, anger, and ignorance." At that time, Eliminate-Obstructions Bodhisattva held the feet of the Dharma-master and said: "I have not yet attained the clear eyes, and I have lost the wonderful way, who can be my guide? Now I am thirsty for Dharma and willing to taste the flavors of Dharma. Now I have not yet achieve the peerless correct perfect enlightenment(Anuttara-samyak-sambodhi), please make us excel at cultivating the Dharma-seed of Bodhi, purify our material bodies, make all our virtues indestructible, and let all sentient beings know this Dharma." The great congregation then said together: "Please do not keep it to yourself, Dharma-master, please give us this Six-Words-Great-Enlightening-King Dharma, to make us achieve Anuttara-samyak-sambodhi quickly, to make us able to turn the twelve Dharma-Wheels, relieve the sufferings of all sentient beings, and liberate them from the transmigrations. We have never heard of this Great-Enlightening-King before. Now please give us this Six-Words-Great-Enlightening-King Dharani, to make us able to be refuges for all those who are helpless and have no dependence, to ignite the brilliant torch in the dark night." The Dharma-master said: "This Six-Words-Great-Enlightening-King Dharani is difficult to encounter, it is as indestructible as the Vajra. Having it is like seeing the utmost wisdom, the endless wisdom, and the Tathagata's pure wisdom; is like entering the supreme liberation, which is far apart from greed, anger, ignorance, and the sufferings of transmigrations; it is like Dhyana, liberation, Samadhi, and Samapatti; is like entering all Dharmas, so that one will constantly be liked by sages." "Suppose there are some virtuous persons, in order to seek for liberation, they pay homage to and practice various non-Buddhist dharmas in many places. They may worship Sakra-devanam-indra(God of the 33 heavens), or worship laymen, or worship green-robe people, or worship God of the sun, or worship Mahesvara(The Greatest god of three-realms), or worship the Narayana God; and they may stay among Garudas or naked-heretics(Nirgrantha). They love those places, but they cannot be liberated from the ignorance and falsehood. They only have the name of cultivating but moil in vain. In fact, all heavenly beings, including the Great-Brahma God, Sakra-devanam-indra, Narayana God, Mahesvara, Gods of suns, Gods of moons, Gods of wind, Gods of water, Gods of fire, Yama dharma king, the four great heavenly kings, are constantly seeking for my Six-Words-Great-Enlightening-King, because if they get my Six-Words-Great-Enlightening-King, they will all be liberated." "This Dharani eliminates all obstructions, it is the mother of all Tathagata's Prajna Paramita. When proclaiming this Six-Words-Great-Enlightening-King, all Tathagatas, Arhats, Samyak-sambuddhas and Bodhisattvas should respectfully join their palms and pay homage to it. Virtuous man, this Dharma is the most supreme, quintessential, pure, delicate and wonderful Dharma in Mahayana. Why? Because it is come from all Mahayana Sutras, Geya(repeating verse)s, Vyakarana(insignia-awarding)s, Gatha(verse)s, Avadana(parable)s, Jataka(Causal-stage life)s, Vaipulya(corrective and extensive)s, Adbhuta(rare)-Dharmas, Upadesa(discuss)s, etc." "Virtuous man, having this prime mother, do we need more to achieve the still liberation? For example, someone harvests his fine rice paddies, carries them home, fills his vessels with the paddies, basks them to make them dry, knocks, fans and shucks them and throws away the chaffs, and finally he get the fine grains. Likewise, other Yogas are like those chaffs, and this Six-Words-Great-Enlightening-King is like the fine grains in the midst of all Yogas. Virtuous man, for the sake of this Dharma, Bodhisattvas practice Donating Paramita, Precepts-keeping Paramita, Forbearance Paramita, Diligence Paramita, Dhyana Paramita, and Prajna Paramita. Virtuous man, this Six-Words-Great-Enlightening-King is difficult to encounter, chanting it only once can make all Tathagatas make offerings to the practitioner with clothes, drinks, foods, soups, medicines, seats, beds, and other materials." Eliminate-Obstructions Bodhisattva then said to the Dharma-master: "Please give me this Six-Words-Great-Enlightening-Dharani." When the Dharma-master was still considering, a voice suddenly came from the sky, saying: "Sage, please give him this Six-Words-Great-Enlightening-King." The Dharma-master then thought: "Where did this voice come from?" And once again the voice from the sky said: "Sage, now the preparative practices and wishes of this Bodhisattva are coincident with the Dharma, please give him this Six-Words-Great-Enlightening-King." At that time, the Dharma-master saw that in the sky, Lotus-hand(Padma-pani) Bodhisattva and Lotus- fortune Bodhisattva appeared. Having the autumnal moon like skin color, wearing precious crowns on their head, and with the beautiful topknots, they were representing the universal wisdom which is especially excellent, wonderful and sublime. During the speech of this Dharani, the earths were shaking in six ways, and afterward, Eliminate-Obstructions Bodhisattva gained this Samadhi, and also gained Delicate-and-wonderful Samadhi, Arousing-Mercy-and-Compassion Samadhi, and Corresponding-Practices Samadhi. 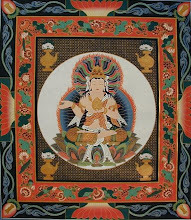 Having gained those Samadhis, Eliminate-Obstructions Bodhisattva made offerings to the Dharma-master with plenty of the seven treasures that can fill up the four great continents. At that time the Dharma-master said: "Now what you offer are not worth even one word of the Dharani, how can you make offerings to the Six-Words-Great-Enlightening Dharani? I do not accept your offerings. Virtuous man, you are a Bodhisattva, a sage, not a mundane person." Eliminate-Obstructions Bodhisattva then made offerings to the Dharma-master again with many jewel necklaces each worth millions of pearls. The Dharma-master then said: "Virtuous man, listen to me, you should use these treasures to make offerings to Sakyamuni Tathagata, Arhat, Samyak-sambuddha." Thereupon, Eliminate-Obstructions Bodhisattva bowed at the feet of the Dharma-master, having done that, he was satisfied and said farewell to the Dharma-master. He then went back to the Jeta Grove Garden, having arrived, he bowed at the feet of the Buddha. At that time the Bhagavan Sakyamuni Tathagata, Arhat, Samyak-sambuddha said: "Virtuous man, I know that you have gained it." "Yes Bhagavan." The Buddha said: "When those 77 koti Tathagatas, Arhats, Samyak-sambuddhas are speaking this Dharani, in one of the pores on the body of Avalokitesvara Bodhisattva, which is called sunlight, there are immeasurable hundreds of thousands of millions of kotis of nayutas of Bodhisattvas. 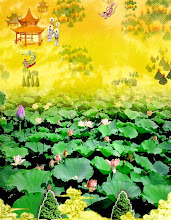 Inside that sunlight pore, there are also 12 thousand gold mountains; each of those mountains has 1200 peaks, and is adorned with lotus and colorful jewels around it. Around those mountains, there are also heavenly Mani pearls and happy gardens. Inside that pore, there are also immeasurable hundreds of thousands of millions of golden precious sublime edifices, with hundreds of thousands of clothes, pearls and jade-like jewelries(Keyura) hanging over them. Inside those edifices, there are many delicate and wonderful wish-granting pearls, which offer all needed materials for those Bodhisattvas. At this time, those Bodhisattvas entered into the edifices and chanted the Six-Words-Great-Enlightening Dharani, and then they saw the stage of Nirvana. Having reached the stage of Nirvana, they saw the Tathagata, and also saw Avalokitesvara Bodhisattva, and then they became joyful. After that, those Bodhisattvas went out from the edifices and walked around the precious gardens, and then went to the bath pools. Afterward, they went to the lotus colored precious mountain, stayed at one side, sat cross-legged in the lotus position, and entered into Samadhi." "Virtuous man, those are the Bodhisattvas dwelling in that sunlight pore". The Buddha said, "And there is another pore called Sakra-devanam-Indra-king, inside it there are immeasurable hundreds of thousands of millions of kotis of nayutas of non-retrograde Bodhisattvas. Inside that Sakra-devanam-indra-king pore, there are also 80 thousand heavenly golden precious mountains. In those mountains there is a wish-granting Mani called lotus light, which gives those Bodhisattvas whatever they want according to their thoughts. In those mountains, the Bodhisattvas can get any drinks and foods as long as they have a thought of wanting them. They do not worry about or suffer from transmigration, and constantly concentrate on their bodies, without any other thoughts." "Virtuous man, there is also a pore named Great-Medicine. 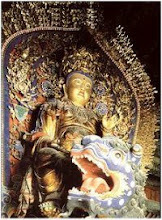 Inside it there are immeasurable hundreds of thousands of millions of kotis of nayutas of Initial-resolve Bodhisattvas. Virtuous man, there are 99 thousand mountains inside that pore, in those mountains, there are Vajra precious caves, gold precious caves, silver precious caves, Indra-nilamukta precious caves, lotus colored precious caves, green precious caves, Sphatika colored precious caves. Each of those mountain-kings has 80 thousand peaks, adorned with myriad of wish-granting Mani and various wonderful jewelries. Inside those peaks, there are many Gandharvas who often perform music. 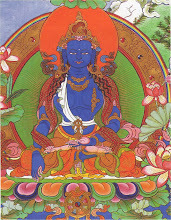 Those Initial-resolve Bodhisattvas often meditate on emptiness, non-form, no-self, the suffering of being born, the suffering of aging, the suffering of having illness, the suffering of death, the suffering of being separated from what we love, the suffering of being associated with what we dislike, the suffering of being fallen into Avici hell, the suffering of the sentient beings in Black-ropes hell, the suffering of the sentient beings in the destinies such as hungry ghost, and so on. When meditating on those things, they are staying at those mountains, sitting cross-legged in the lotus position and then enter into Samadhis." "Virtuous man, there is another pore named Painting-king. 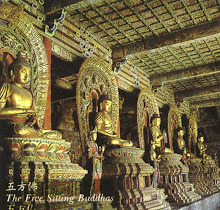 Inside it there are immeasurable hundreds of thousands of millions of kotis of nayutas of Pratyeka-buddhas, who are emitting flaming light. Inside that pore, there are hundreds of thousands of millions of mountain-kings, which are adorned with the seven jewels. On those mountain kings, there are various Kalpataru trees, their leaves are made of gold or silver, and they are adorned with innumerable hundreds kinds of treasures. 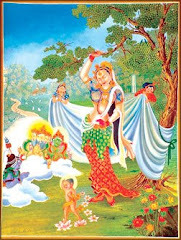 Moreover, many precious crowns, jade ornaments, clothes, various precious necklace(keyura), various precious bells, and Kausika clothes are hanging over those trees, and the gold bells and silver bells are tinkling. Those mountains are full of such Kalpataru trees, innumerable Pratyeka-buddhas are dwelling there, constantly expounding the Sutras, Geya(repeating verse)s, Vyakarana(insignia-awarding)s, Gatha(verse)s, Avadana(parable)s, Jataka(Causal-stage life)s, Vaipulya(the corrective and extensive)s, Adbhuta(rare)-Dharmas, Upadesa(discuss)s, etc. 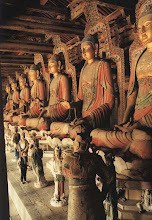 Eliminate-Obstructions, at this time, those Pratyeka-buddhas came out of that pore." "Finally, there is a pore named Streamer-king, which is 80 thousand yojana in width and length. Inside it, there are 80 thousand mountains adorned with various wonderful treasures and wish fulfilling Manis. On those mountains, there are innumerable kalpataru trees, innumerable hundreds of thousands of millions of sandalwood(Candana) trees, and innumerable hundreds of thousands of millions of huge trees. There are also diamond(Vajra) precious grounds, and there are 99 edifices, with hundreds of thousands of millions of gold, treasures, pearls, precious necklace, clothes hanging over them. So this is the scene in that pore." 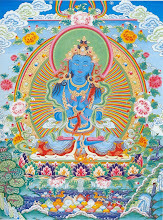 Having spoken to Eliminate-Obstructions Bodhisattva, the Buddha said to Ananda: "For anyone who does not know the karma retributions of spiting, urinating, defecating, or doing other bad things in sublime abodes(temples, monasteries, etc. ), now I am telling you the retributions." "If anyone spits onto the ground, he will be reborn as a needle-mouth insect in a Sala tree for 12 years." "If anyone urinates, or defecates onto the ground of Sangha abodes(temples, monasteries, etc. ), he will be reborn as a nasty worm in urine or excrements in Varanasi big city." "If anyone uses the teeth-wood (danta-kastha)s without permission, he will be reborn as a tortoise, fish, or makara fish." "If anyone steals the oil, hemps, rice, beans or other things of Sangha (monk)s, he will be reborn as a hungry ghost, with unkempt head hair, staring body hair, mountain-like big paunch, needle-like narrow throat, and will be burnt out, with only the bones remain. The retribution of this person is so miserable." "If anyone despises or disdains Sanghas, he will be reborn in a poor and low family, and wherever he will be born, he will not have a good look or good body. His body will be hunchbacked, bended and short. After the lifetime in such a body, in the next lifetime, he will be thin and will have many illnesses. His arms and feet will be crooked, brimful pus and bloods will be flowing on his body. He will suffer from these miserable retributions for hundreds of thousands of myriads of years." "If anyone steals Sanghas' lands, he will fall into the great howling hell, swallowing the iron balls, his lips, teeth, palates, and throat will all be burnt out. His heart, liver, intestines, stomach and his whole body will also be burning. 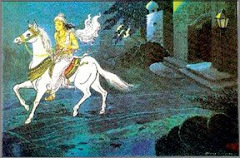 Subsequently, a karma wind will blow to him and make him relive, and then Yama jailers will drive and force this sinner. Affected by his own karma, he will has a huge tongue, with hundreds of thousands of myriads of iron ploughs furrowing on it. Having suffered from such miserable retributions for thousands of myriads of years and gotten out of this hell, he will then enter into the great fire caldron hell. In there, the Yama jailers will drive and force the sinner, sting his tongue with hundreds of thousands of myriads of needles. Due to the karma force, he will not die. The jailers then will drive him to the fire pits and throw him into them, and then drive him to the Hopeless-river(Nai He) and throw him into it, and he will not die too. In a similar way, he will pass through many other hells, for three kalpas. Afterward, this person will be born in a poor and low family in the southern continent Jambudvipa, and will be blind. These retributions are really painful, so be careful, do not steal any property of Sanghas." "For the precept keeping Bhiksus, they should accept and uphold the three robes. When they enter into the kings' palace, they should dress the first great robe; when they are in the assembly of Sanghas, they should dress the second robe; when they are working, in villages, towns, cities, or walking, they should dress the third robe. Bhiksus should accept and uphold the three robes in such a way, then if they attain the precepts they will also attain merits and wisdom. I say that Bhiksus should keep precepts, and should not steal any property of Sanghas. For example, if a person is constantly dwelling in a fire pit, or have taken a heavy burden of poison, he can still be saved; but if he steals the properties of Sanghas, he will not be able to be saved." At that time, wise-life (Ayusmat) Ananda said to the Bhagavan: "We will fully study and practice as the Buddha taught. Bhiksus should accept and uphold the precepts (pratimoksa), earnestly stay in and protect the teachings of the Bhagavans." 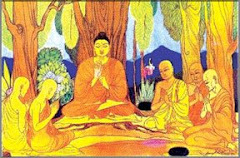 Afterward, wise-life (Ayusmat) Ananda bowed at the feet of the Buddha, circumambulated the Buddha and then withdrew. The great voice-hearers (Sravaka) returned back to their dwellings severally. The gods, dragons, Yaksas, Gandharvas, Asuras, Garudas, Kinnaras, Mahoragas, human and non-human beings of all worlds, hearing what the Buddha had said, were very joyful. They believed and accepted it, made obeisance to the Buddha and withdrew.